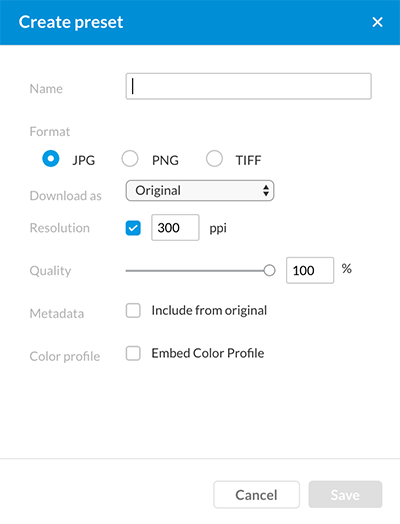 One of the ways of downloading images in Elvis is by making use of a Download Preset: a group of saved settings that otherwise would have to be set manually each time these settings are needed. 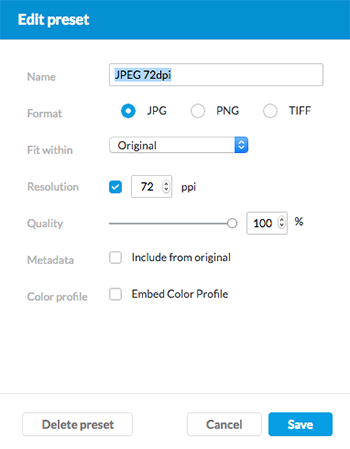 This article explains how to create, assign, edit and delete Download Presets. Creating Download Presets is done by using the Management Console and requires an account with admin credentials. Download Presets can only be assigned to user groups, not to individual users. Make sure therefore that user groups have been set up. 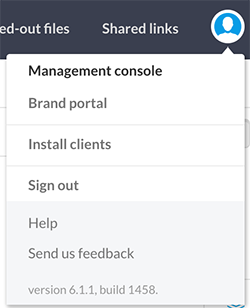 Managing Download Presets is done on the User Groups page in the Management Console. Step 2. In the menu on the left side of the page choose Permissions > User Groups. The Manage User Groups appears. Step 3. In the menu at the top, select Download Presets. Note: In Elvis 6.11 and earlier, this option is just called 'Presets'. Figure: The page for managing Download Presets in the Management Console. Step 1. Access the Download Presets page (see above). Step 2. At the bottom of the lists of presets, click the + icon. The Create Preset window appears. Name. Add a descriptive name. Original. Download the image in its original size. Percentage of original. Set a percentage. Metadata. Define if the metadata of the original file should be included. Note: The PNG format does not support embedded metadata and does not support including metadata from the original. Color profile. Define if the color profile that was used to generate the preview should be included. The Download Preset is added to the list. Before a user can use a Download Preset, it needs to be assigned to a user group. Assigning a Download Preset can be done manually or as part of copying Permissions from an existing user or user group. Step 2. From the list of user groups, select the user group to which the Download Preset needs to be assigned. Tip: Use the Filter to narrow down the results in the list by typing any part of a name. Step 3. From the list of presets, select the Download Preset that needs to be assigned to the group. To select a preset, click anywhere on its row. To select all presets, click Select all above the list. To narrow down the results in the list, use the Filter by typing any part of a name. Copying Permissions is an efficient way of quickly assigning an existing set Permissions to a user or group. Warning: When copying, all existing Permissions for that user or user group will be replaced. Info: This feature requires Elvis 6.13 or higher. Step 1. From the list of users or user groups, choose the user or group from which you want to copy the assigned Permissions. Step 2. At the bottom of the list, click the Copy button. The 'Copy Permissions To' window appears. Step 3. From the list of users or groups, choose the user or group to which you want to copy the Permissions. Step 4. 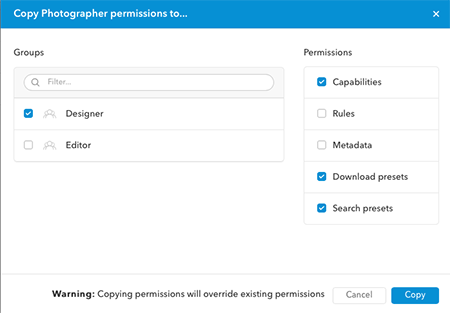 In the list of Permissions, select which type of Permissions should be copied. Step 2. Hover the mouse over the preset that you want to edit. Step 3. Click the icon and make any changes in the Edit Preset window that appears. Click Save when finished. Step 3. Click the icon. The Edit Preset window appears. Step 4. Click Delete and confirm that you want to delete the Download Preset. 3 April 2018: Updated section 'Assigning a Download Preset to a user group' by adding steps for copying Permissions. 13 March 2018: Updated section 'Managing Download Presets' with the information that 'Download Presets' in the Management Console is named 'Presets' in Elvis 6.11 and earlier.